Ignite your creative mojo with the saturated colors and resplendent artwork of the Blazing Poppy Paper Collection from Heartfelt Creations. Fields of flaming poppies dance on a canvas painted in blush, peach, coral, scarlet, ebony and jade. 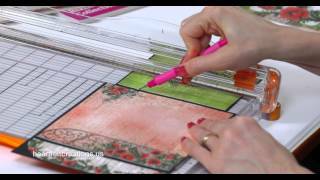 Heirloom lace, flower laden arbors, ornate flourishes, flowing script, bold stripes and neutral backgrounds fill designer papers that are bursting with card fronts, borders, tags, tickets, tabs and elegant artwork. This paper is part of the Blazing Poppy Collection. 1. Paper Size: 12" x 12"
2. Quantity: Twenty-four (24) double sided sheets; two sheets of paper per design.